Submitted by Stefan Drissen on Wednesday, May 16, 2018 - 20:40. Music creation software. Similar to E-Tracker in many ways, but prettier and easier to use. It was capable of handling more patterns, more instruments, and (most importantly) more effects which are applied to notes - such as tremolo and portamento. It appeared on the market relatively late, several years after E-Tracker had gained a virtual monopoly, and never seemed to become heavily used. 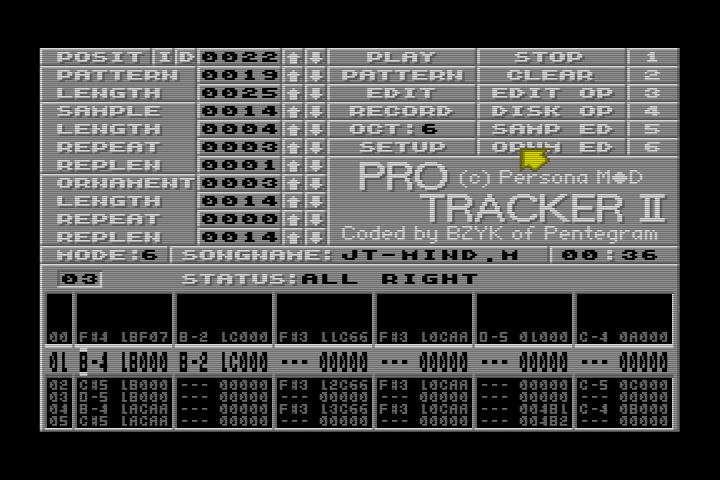 It also shipped without a compiler, although ProTracker 2 compiler was written by another programmer a few months later and released on Persona’s Blitz disk magazine. Music is arranged in patterns of (up to) 64 notes. Patterns can be played in any order, the order is defined by the song list. Each note is played using a sample (actually chip music, but defines the variation of volume and pitch over time) and optionally an ornament (extra effects overlaid on the sample, which alter pitch a whole number of semitones). Each row can also contain an effect, which make various changes to the note, or other control such as song position etc. 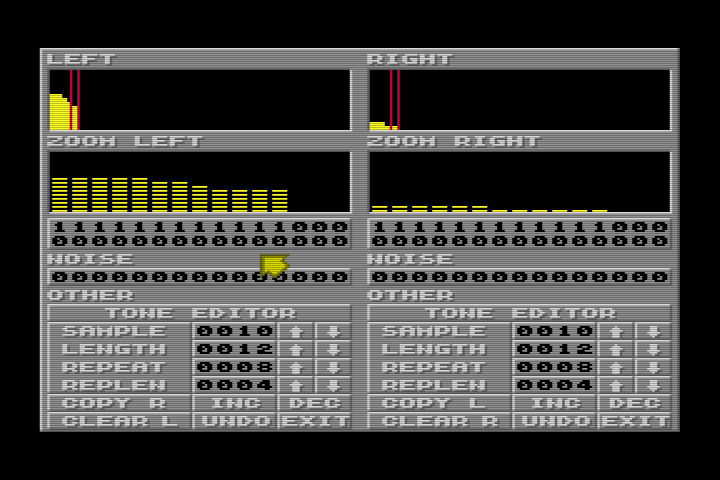 The Sam soundchip has six channels, you can choose MODE 3 or 6 to change how many are visible at one time (in mode 6 you can see a note’s ornament or its effect but not both). There are five bookmark positions, associated with F7, F8, F9, F4, F5 which initially are set to 0, 16, 32, 48, 63 respectively. The bottom two rows of keys act as a piano keyboard (Z plays a C, S plays a C# etc). Notes are played using the current sample, ornament, and octave. In edit mode these are placed into the pattern at the current cursor position, and the cursor moves down by ‘editskip’ rows (1 by default). Don’t store a sample at entry 0, or there may be unexpected effects (sample ‘0’ has the special meaning of not changing the last used sample. This is important as the gaps between notes generally have 00 as their sample field). Click in the left or right boxes to select which portion appears in the zoom window. Click in the zoom window to set the volume for each frame. Also in the zoom window, left and right cursors move the visible portion left and right, up and down cursors change the volume at the pointer. The top row of numbers is the tone mask (0 = silence, 1 = allow the note frequency to play), the second row is the noise mask (0 = silence, 1 = allow white noise to play). Both can be set simultaneously. The mask is always the same for left and right channels. The bottom row is the pitch of the noise (if noise is playing). 0 is the highest pitch, 1 is lower, 2 more so. 3 causes the pitch to depend on the tone frequency in use by channel 1 (if the noise is playing on channels 1, 2 or 3) or 4 (otherwise). (Any noise being played on channels 1,2 and 3 must be at the same frequency, so if two different tracks contain noise effects it is usual to put one in 1,2 or 3, and the other in 4,5 or 6 so that they don’t interfere with each other). Tone Editor button switched to the tone editor, where the pitch for the sample can be adjusted in tone-number increments (1/256 of an octave approximately). Don’t store an ornament at entry 0, for similar reasons as not storing a sample at entry 0. Ornaments adjust the pitch of a note in semitones. Click on the songname to change it, if necessary, and then click on ‘Save Module’ to save your whole file. In panel 2, items under the “Record” heading modify the behaviour of the “Record” mode which tends to be so unresponsive that I never use it anyway. Items under the “Samples” heading allow you to copy and/or move samples (“S”) but also ornaments (“O”), tracks (“T”) and patterns (“P”) from one index to another. Various defaults. None of it seems to be very important. The effects are based on effects available in MOD files. Only a subset of them are supported by the compiler as I never was able to work out what the others actually did. Commands are effective only on their own channel. Commands should be repeated on following lines for as long as they are to remain in effect. 0xy Produce a “false chord” by cycling tone each frame between the given tonic, and notes x and y semitones higher. 1nn Slide the current tone upwards at a rate of nn tone numbers per frame. 2nn Slide the current tone downwards at a rate of nn tone numbers per frame. 3nn Slide the current tone towards a given note at a rate of nn tone numbers per frame. 8xy Setup the soundchip’s waveform function. Bnn End the current pattern and jump to the start of the pattern at sond position nn. Effective on all channels. Cxy Set instrument volume level to x on the left side, y on the right side. 0 is silent, F gives normal volume. D00 End this pattern and jump to the beginning of the next pattern in the song table. Affects all channels. 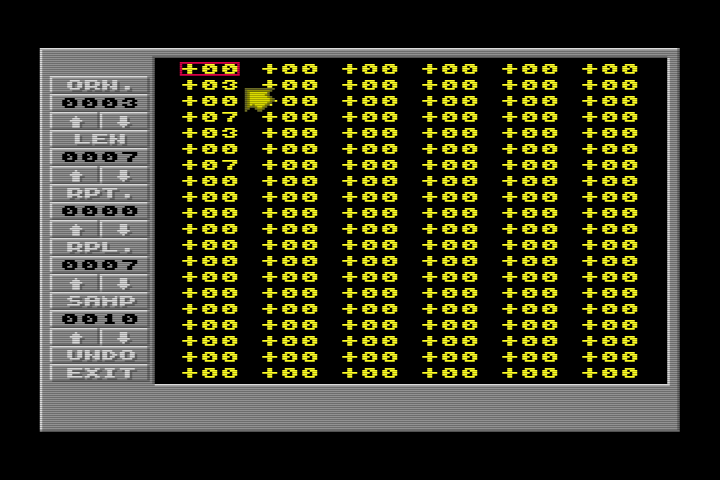 Note that the ProTracker2 editor allows commands of the type Dnn, which jumps to row nn of the next pattern. This will NOT work on the compiler. E6x Used to repeat sections of a pettern. Affects all channels. E60 marks the beginning of a repeated section, E6x repeats that section from beginning to end x times. EDx Delays the start of a new note by n frames. Otherwise (if used when not starting a note) the command will silence the channel completely until an EDx command is used with a new note. EEx Pauses for x+1 added beats. Affects all channels. Fnn Set the tempo to nn frames per beat. Effective until set otherwise. This remains set until specifically disabled (with x=y=0). It acts either on the pair of channels 2 and 3, or the pair of chanels 5 and 6. Sawtooth waveform plays one octave lower than repeated attack or decay.